The previous three rounds of talks were "unproductive". The fourth round of negotiations on Donbas settlement between US Special Representative for Ukraine Kurt Volker and Russian presidential aide Vladislav Surkov is scheduled for next week, US Ambassador to Russia Jon Huntsman told Kommersant FM radio station, according to an UNIAN correspondent in Russia. "Both sides will meet next week," he said. Huntsman recalled that the previous three rounds of negotiations had been unproductive. However, according to the US envoy, the very fact that the negotiation process is underway inspires confidence. Huntsman expressed hope that the fourth round of talks would yield some progress and that the USA and Russia would be moving away from the lowest point in their relations. The two countries still need to overcome the existing contradictions to this end, Huntsman said. According to the diplomat, a significant deterioration in bilateral relations took place as a result of Russia’s aggression in Ukraine, including Crimea annexation, and meddling in the US elections of 2016. He has also stressed that once Minsk agreements are fully implemented, Russia sanctions could be lifted. Huntsman stressed that the Ukrainian settlement is the main obstacle in reestablishing better ties between the Russian Federation and the United States. 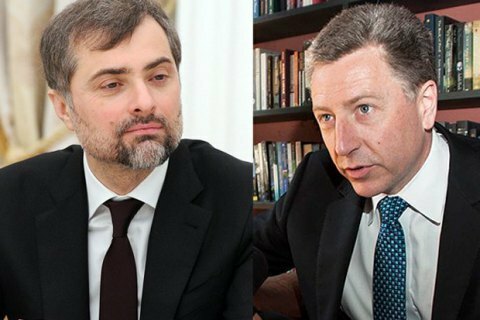 Volker and Surkov met in Minsk on 21 August and in Belgrade on 7 October and 13 November, During the last meeting, Volker stated that the two countries would continue to make efforts to end the war in Donbas, despite various views on the ways of achieving peace.